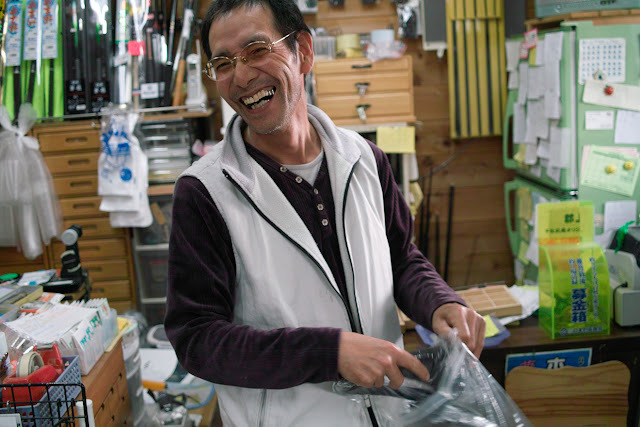 Near Gujo, on our way up to the Itoshiro river, we stopped at a well known tackle shop run by Hirata-san. Hirata-san is known in the area, and among the tenkara community, for his specialty flies, the mamushi kebari, or snake flies. In his forays, if he runs across a mamushi, a highly venomous snake, he’ll catch it and use the skin to tie his tenkara flies. While, as I mentioned before, one fly pattern should be enough for successful fishing, different anglers will have different opinions on what works best. Hirata-san thinks the mottled look of the snake skin, along with its slight reflective surface, are highly attractive to fish. At $10 each they are not cheap, but he justifies it by saying that “I’m risking my life to make these flies”. I figured they would be a nice addition to the tenkara museum. Very interesting Daniel! It’s hard to tell from the photo but is the snake skin cut into strips and then wound around the body of the fly? Hey Jason, yes, that’s how he does it. Is this sakasa or ishigaki style? It’s not quite either, though more closely related to Dr. Ishigaki’s fly. So, “sakasa” means reverse. That’s when the hackle is facing forward. This fly has the hackle more straight up. Dr. Ishigaki ties primarily a fly that is black thread and hackle, but he’s not particular about how he ties it. The “Ishigaki” fly is the one people would recognize as his. Some of his flies are “sakasa” style, some not. The ones we offer cup forward slightly like most of his, but we wouldn’t call it sakasa. So, most tenkara anglers in Japan have their signature fly that they use. Mr. Hirata likes this fly tied with snake-skin. So, this is the “Hirata-style”, but notice the hackle is not particularly forward-facing.